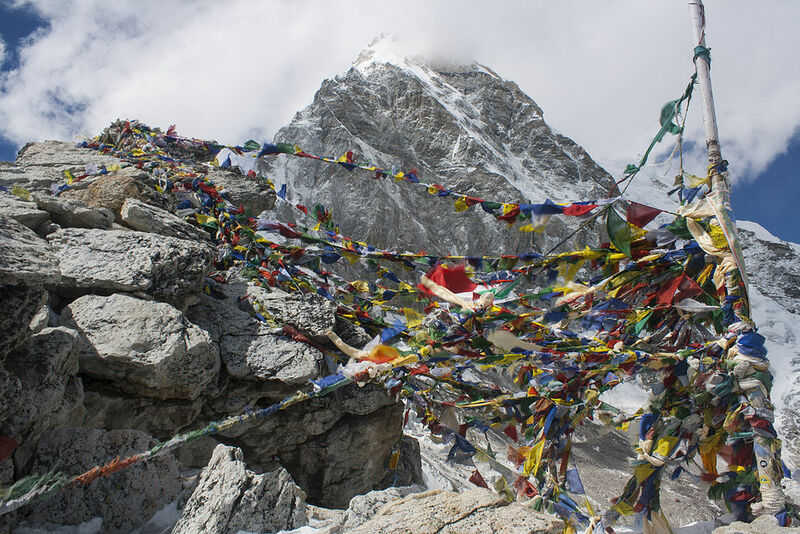 Everest Base Camp trek is what lures thousands of tourists to the beautiful country of Nepal. The mesmerizing view of the mountains in the Everest region and the cool climate is sure to take your breath away. The Everest Base Camp trek lasts 16 days long. This trek takes you to some of the most beautiful places in the Everest region: Namche Bazaar, Everest Base Camp, and Kala Pathar. Along with the visit to the Base Camp of the highest peak in the world, you will have a rich cultural experience. Except for mountain peaks, this trek has many things on offer. The natural vegetation, the animals along the way plus, a glimpse into the Tibetan Buddhist culture that flourishes in the Everest region. You will land in Kathmandu. Kathmandu is located at an elevation of 1,350m/4,428ft. You can spend the evening in your hotel and get rid of the physical and mental tiredness you might have felt in your flight to Nepal. You can spend this day taking casual walks and sightseeing in Kathmandu. There are many places of religious and cultural importance in Kathmandu. Many of these places are listed in the UNESCO World Heritage Sights. These places include three Durbar Squares. Kathmandu Durbar Square, Patan Durbar Square, and Bhaktapur Durbar Squares have wonderful temples and museums to go along with them. Boudhanath Stupa and Swayambhunath Stupa, known as monkey temple are two other places you would not want to miss out on. Lukla is located at an altitude of 2,651m/8,700ft. You will get there on a 40 minutes flight from Kathmandu valley. From Lukla, you will trek to Phakding which will 3 – 4 hours long. The total distance of this trek is 8 km. 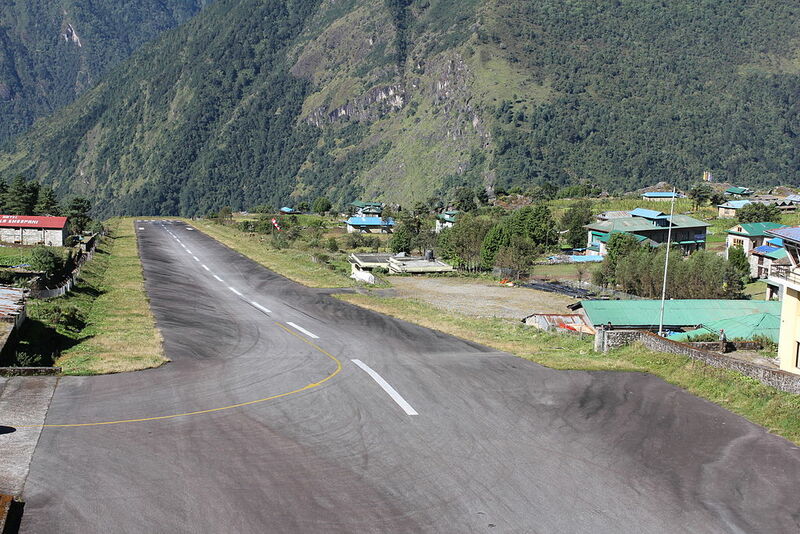 You will take the flight to Lukla in the early morning. From Lukla, you will walk in a trail that will gradually descend to Cheplung village. From here, you will get a glimpse of Mt. Khumbila, a sacred mountain which has never been climbed. Slowly, you will descend and reach Phakding. And will rest overnight in Phakding. You trek through pine forests. This trail leads you North up the Benkar valley. You will cross Chumoa and Monjo villages leading to the entrance of the Everest National Park. Along the way to the National Park, you will also have crossed Dudh Koshi River. Then, you will trek next to Dudh Koshi and Bhote Koshi rivers. A steep trail will greet you. After you ascend it, you will reach Namche Bazaar. This is the biggest town in the Everest region, where you will stay overnight. When you are trekking in the Everest region, you need to spend acclimatizing. The altitude sickness will infect you in case you don’t pay attention to acclimatizing. So, this day will give your body time to get used to the low amount of Oxygen present in the mountains. But, you don’t have to worry about missing sightseeing. 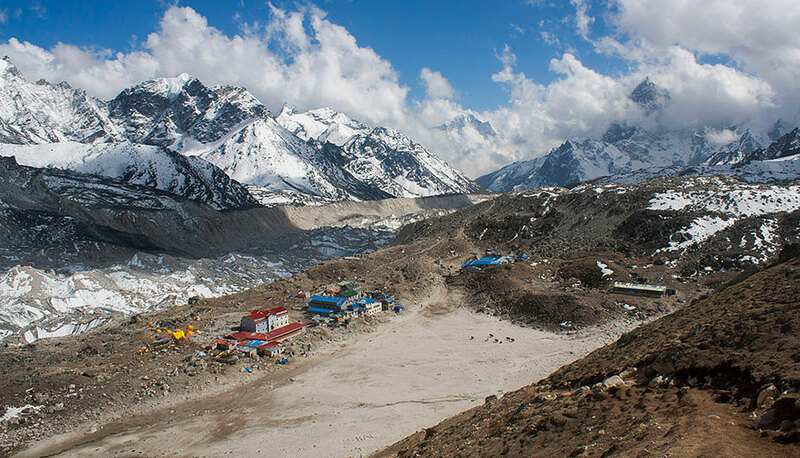 You can hike-up to Sagarmatha National Park. The views of the sunrise over Mt. Everest, Lhotse, Nuptse, Ama Dablam, Thamserku, and Kongde will be beautiful. You can trek to Khumjung village as well as go to Hillary school on the same day. Namche to Phunki is a comfortable trek. 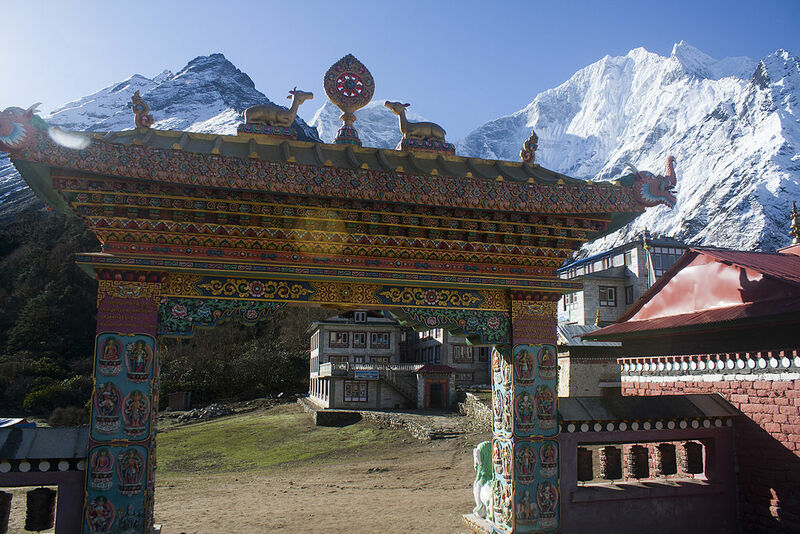 From Phunki you will descend to Tengboche village, which is the home of Tengboche monastery. This is the biggest monastery of the Everest region. The monastery falls within the boundaries of Sagarmatha National Park, a UNESCO World Heritage Site. You can enjoy beautiful views of Mt. Everest, Nuptse, Lhotse, Ama Dablam and Thamserku from this monastery. Sagarmatha National Park has a rich assembly of birch, confer and rhododendron trees. So, while trekking from Tengboche to Dingboche, you can see the beautiful plants along the way. Besides, you can also get good views of Mt. Everest, Lhotse, and Ama Dablam. Your trail will take you downhill to Debuche. You will also cross the Imja River to reach Pangboche along the way. You will go through the Pangboche trail. This trail will take you into an encounter with the Pangboche Monastery. 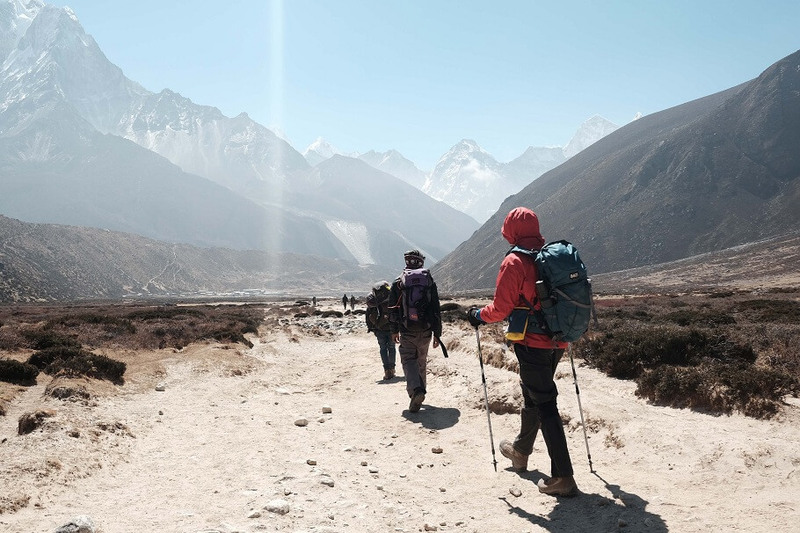 Walking through the Imja Valley and Lobuche River, you will reach Dingboche. It is a scenic village which acts as a breadbasket of the Everest region. The higher up you go, the more time you need for resting and giving your body a proper amount of time for acclimatizing with the climatic conditions there. Hence, you will spend a day acclimatizing in Dingboche. Spending a day in Dingboche becomes very important because this is the first place where you touch the altitude of 4000 meters. Just because you’re acclimatizing, it doesn’t mean that you will spend your day idly!! You will climb a ridge in Dingboche which will help you view mountain peaks like Lhotse, Makalu and Cho Oyu, Cholatse and Taboche. On the Northwest of the village, you can also see peaks like Lobuche West, Lobuche East, and Lhotse. You can view the majestic mountains along your side when you start your trek. The campsite of the first successful Everest Expedition in 1953 is also located along the way. And, so is Mt. Pumori. Walking further uphill, you will get to Duglha. It is a small village and is also home to a Memorial Shrine which you can visit. From Duglha, you will go uphill to Khumbu Glacier. You will also ascend Chupki Lhara, a ridge that makes viewing mountains scenic. The top of the ridge acts as a homage to all those who lost their lives while trying to climb Mt. Everest. You will then descend to Khumbu Glacier moraine. There you will find yourself facing several great peaks including Khumbutse, Lingtren, Pumori and Mahalangur Himal. While crossing Khumbu Glacier, you’ll see Mt. Nuptse. You will also visit Everest Base Camp located at an altitude of 5364 m/17,594 ft. The trek to Everest Base Camp is full of walking in a path that contains a glacier. Khumbu glacier is what you’ll encounter frequently. The Everest Base Camp is awesome to view. But you can’t see Mt. Everest from the Base Camp. However, you can view Mt. Nuptse, Khumbuste and Pumori mountains from the Base Camp. After you’ve enjoyed the beauty of the Base Camp, you will walk back towards Gorak Shep. There you’ll spend your night. From Kala Pathar, you will go to Pheriche. Pheriche is located at an altitude of 4,288m/14,070ft. We wake up early for the walk up to Kala Patthar. The trek will start early when it is fairly dark outside. On your way to Kala Pathar, you will see Lingtren, Khumbutse, and Changtse mountains. Kala Pathar offers the best view of Mt. Everest as well as the other peaks visible from there. From Kala Patthar, you will walk back to Gorak Shep. Kala Pathar to Gorak Shep is a walk downhill and therefore restful to the legs. After taking your lunch in Gorak Shep, you will get down to Pheriche which is also downhill. You will lose quite a bit of altitude this day. You descend to an altitude of 3400 meters. Your path will be through rhododendron and juniper trees. You will also cross a bridge over the Dudh Koshi River. Other wild animals will also be visible while you are descending. You will also get to Sansa from where you can have scenic views of Ama Dablam, Thamserku, and Nuptse mountains. Eventually, you will reach Namche Bazaar. Your trek from Namche Bazaar to Lukla will be through a downhill rocky terrain alongside the Dudh Koshi River. Along the way, you will find suspension bridges, several monasteries, and villages. You will spend the rest of the day in Lukla. This will be your final day in the Everest region. The next morning, you take the flight to Kathmandu which is much scenic. Waving goodbye to the astounding mountains along the way, you freshen up your trekking experiences. You can spend this day sightseeing in Kathmandu and try the various cuisines around the valley. Or, you can spend the day shopping for souvenirs. On this day, you will take a flight back to your beloved country. Nepal and trekking to the Everest will have given you a wonderful time to remember and cherish for the rest of your lives. The Everest Base Camp requires you to allocate a long time for trekking. This means that you need to prepare and train well with wise packing. If this route feels a long time, you can try the Everest Base Camp trek for 13 days or 14 days. The alternatives to this trek are choosing a helicopter tour to Everest or the Everest Base Camp Heli trek. And, if you are willing to spend a bit of time in the Everest region, you can try out the Everest Base Camp high pass Trek or the Gokyo Valley Trek. Explore all your options and have a wonderful time in the Everest region.